Mrs. Abosede Omobolanle Adelaja, Nee Ogunbekun, was born on the 12th of May,1963. She attended St. Jude’s Primary School between 1969 to 1975 and obtained her First School Leaving Certificate in 1975. She was a student at the Government College, Agege, Lagos from 1975 up till 1980 when she obtained her West African School Certificate. She graduated from the University of Lagos with a Bachelors Degree in Educational Administration followed by a Masters Degree in Educational Administration in 1985 and 1990 respectively. Abosede Omobolanle’s public service sojourn commenced at Eric Moore High School in 1986. She was redeployed to work at the Ministry of Education and served in various departments and duty posts which includes Planning Research & Statistics Department (1988-1995), Lagos Mainland Education District (1995-2002), Private Education & Special Programmes Department (2002-2005), Somolu Local Education District (2005-2006) and Lagos State Universal Basic Education Board (SUBEB) 2006 to December 2018. 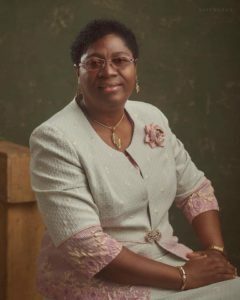 Mrs. Adelaja has held many strategic positions within the Lagos State educational sector, she was Secretary, Departmental/Ministerial Tender Board Ministry of Education 1988-1994, Local Administrator of Education Lagos Mainland District 2001-2002, Head of Secondary Unit, (Private Education & Special Programmes Department) 2002-2005, Head of Inspectorate Unit, Somolu Local Education District 2005-2006, Head of Education Management Information System Unit (EMIS) 2006-2009, Head of Projects Unit in 2009 and served as a member of the Governing Council, Michael Otedola College of Primary Education, Epe, (2015-2018). She was appointed and served as Board Secretary, Lagos State Universal Basic Education Board (SUBEB) in 2015 till December 2018. Mrs Abosede Adelaja was appointed as a Permanent Secretary in the Lagos State Civil Service and posted to the Ministry of Tourism Arts and Culture on the 27th of December, 2018 by His Excellency, the Governor of Lagos State, Mr. Akinwunmi Ambode. She recorded many achievements and received awards of recognition which include, resuscitating Mini Resource Centers at the 20 Local Government Education Authorities in 2010, resuscitated Computer Training in State Universal Basic Education Board (SUBEB) in Year 2015, Award of Excellence from Ifako-Ijaye and Amuwo-Odofin Local Government Education Authorities in 2014 and 2015 respectively and a fellowship award by the Institute of Administration. Mrs. Adelaja is a member of the Nigerian Institute of Management. She loves working with teenagers and helping the needy.